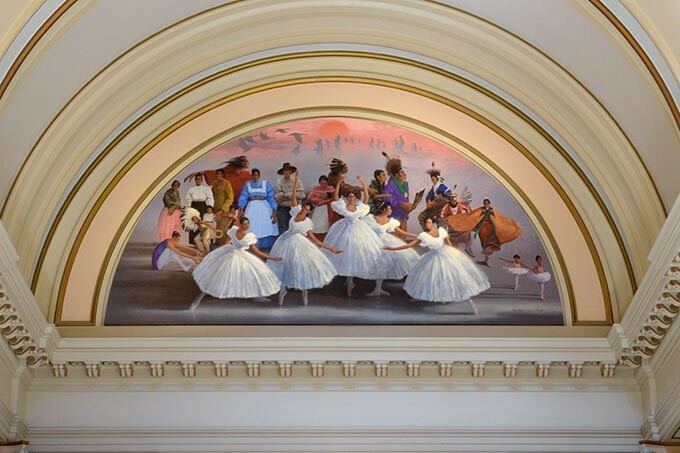 Believe it or not, Oklahoma has an amazing ballet heritage. Oklahoma is home to The Five Moons, Moscelyn Larkin, Yvonne Chouteau, Rosella Hightower, Maria Tallchief, and her sister, Marjorie Tallchief. All five ballerinas are Oklahoma born and eventually became stars on the world’s stage of 20th century ballet. Classical Ballet School is proud to be in the lineage of the Five Moons. Our school founder, Kay Sandel, was trained by Moscelyn Larkin. Classical Ballet School strives with each class to carry on the beauty of our true classical ballet foundation. Click the links below to learn more about The Five Moons and their Oklahoma tributes. This performance had the audience on their feet! Every June Classical Ballet School produces a “real” full-length story ballet. We believe the life-lessons learned from this type of performance experience are GOLD! Recitals just don’t measure up. Our students learn patience, poise and perseverance both from the things that go right and especially from those moments that go a little sideways of perfect. Most of all, ballet is and should be FUN - for those doing it and for those watching it! We will all remember this scene from our production of The Snow Queen. The photo below shows our furry character “donkey-hotay” (a pun on the ballet by the title Don Quixote) as he clip-clops into the festive village scene wearing tap shoes! Now who says ballet is boring! 3 Ways to help you or your child learn a new skill. These helpful hints can be applied to any area of your life! 1. START SMALL: Learning something new can be really intimidating. Take a look at the big picture, but then break it down into manageable pieces. Sometimes it is helpful to set a timer. The Pomodoro app is a great tool for making sure we don’t get sidetracked - the app suggests 25 minute work/5 minute break sets for the most effective progress. 2. USE YOUR IMAGINATION: Studies tell us that when learning a new skill, it is extremely effective to spend time imagining yourself doing the activity. Your mind can’t tell the difference between actual and imagined practice, so find a comfy place, close your eyes, and begin to imagine yourself being the best at the thing you are wanting to learn. Studies also show that it is most effective if we do our imagining as we are falling asleep and right as we wake up. 3. BE KIND: Learning is actually inhibited when we are stressed and impatient with ourselves. So, be patient and kind in the learning process and you will see that your progress greatly improves. “A DREAM written down with a date becomes a GOAL. A GOAL broken down into steps becomes a PLAN. A PLAN backed by action becomes a REALITY!